Today is Saturday, April 30th. It is also the birthday of my friend, Ken Hagen. Although Ken died in 1998, some of the things that we take for granted in this small town came about because of his hard work and determination. Ken championed causes that make this town a nice place to live: bike lanes on Siskiyou Boulevard, curbside recycling, and the creation of the Bear Creek Greenway. He was a true environmentalist and wanted so much to change the way we do things. It was at a meeting of the Ashland Conservation Commission that I first met Ken. He conducted the meeting professionally and I liked that he treated everyone that attended with respect. A short time later, I was asked to join the Conservation Commission. I was delighted to be a part of a group that was making a difference and very impressed by Ken’s dedication and selflessness. What is even more amazing is that though Ken was confined to a wheelchair – crippled by Lyme’s disease – he had more energy than most able bodied people. It was hard to complain about anything when Ken was around. I could walk, run, or do just about anything but often didn’t. Ken was always doing more than everyone else it seemed. Maybe he knew that his time here was limited. I feel so very grateful that I got to know Ken. He was a remarkable human being – smart, funny, and willing to work to make the world a better place. I hope that I can do as much in my life as he did in his. 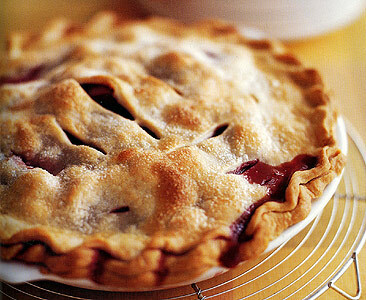 Tonight I delivered a double crusted Strawberry Rhubarb pie to Russ Chapman in remembrance of Ken. Russ served on the Conservation Commission with me and Ken and is as dedicated to conservation as Ken was. It is an honor to have worked with both of them. Even though you don’t see many comments from me on your blog, I want you to know that I look forward to your daily posts and am always moved and inspired by them. The photographs are lovely too. I have caught up on the ones I missed in the last several days. It is nice to remember Ken Hagen. Thank you for this daily gift.